This week is all about two art doll commissions. One I’ve just completed, and the other went to its new home. 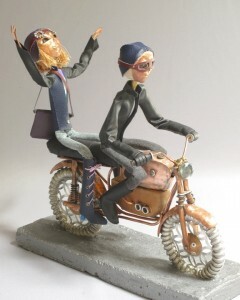 Last week I teased you with some images of parts and pieces of my completed motorcycle art doll sculpture. That piece is now titled “Steampunk Riders” by its owners, and it left the gallery yesterday, so I can share an image without ruining any surprises. I received a nice email of how wonderfully they were received. This was a challenging piece with lots of metal work detail and hand stitching on their clothes, and a complete blast to create. I like the movement and gesture in the final composition. It is such a good feeling to have a piece go where you know it is truly loved, and ties to something else that the owners enjoy and share. I first created a seated art doll writing in a journal that was inspired by a family member who was an accomplished author. That seated figure lead to a similar seated figure reading a book commissioned by a friend. 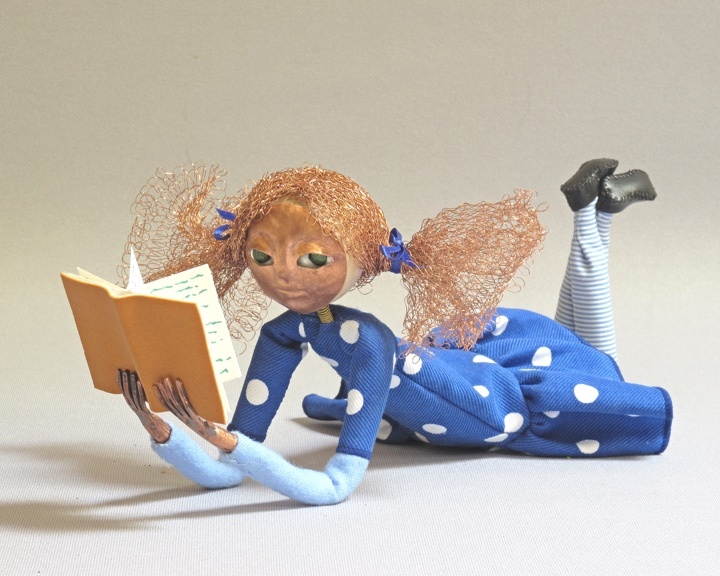 The reader figure inspired me to create a doll lying on the floor reading as a child would. One of my artist friends spied that sculpture prior to its sale, and decided that she needed a similar piece of her very own. This now fourth in my series of literary art dolls is the second commission I completed this week. It is curious how one inspiration leads to another. In this case, I myself saw one person in a piece I created, and others saw a bit of themselves. In this case a love of books tied all these art dolls and their eventual owners to one another. This entry was posted in Art Dolls and tagged art, art doll, book, copper, figure, figure sculpture, mixed media, motorcycle, one of a kind, reading, sculpture, steampunk on July 22, 2015 by lynnadmin.